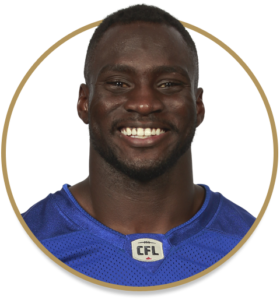 Augustine was signed by the Blue Bombers on May 16th. He was not selected in the 2017 CFL Draft, but was signed by the Edmonton Eskimos and invited to their training camp that year. He returned to university after camp and was then signed by the Saskatchewan Roughriders last February before being released before training camp. Augustine played five seasons with the Guelph Gryphons, rushing for 2,742 yards and 28 touchdowns on 483 rushes. In his senior year, Augustine rushed for 690 yards and nine touchdowns on 122 carries.